VINTAGE COSTUME ESTATE ANTIQUE JEWELRY EARRINGS! W. Germany Ocean Blue Tropical Green Vintage Plastic Dangle Drop Clip Earrings For Weddings, Proms, Pageants And Parties! 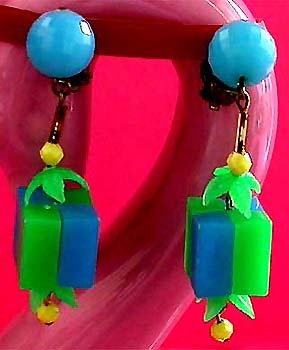 Item #E168224 - W. Germany Tropical Green Ocean Blue Vintage Plastic Dangle Drop Clip Earrings. Size: Length: 2 1/4". Width: 1/2". Are you ready for a summer cruise to the exotic tropical islands? These cute and very collectible earrings are just perfect to go with that pretty summer dress. They are so adorable and tropical! The large sky blue bead (1/2" in diameter) on top is faceted to looking like a disco ball. The square block (over 1/2" x 1/2") in the pendant is geometrically composed of 4 solid rectangular blocks in soothing tropical green and ocean blue colors. They are then further embellished by tropical palm leaves and delightfully petite canery yellow faceted beads! There is also a clear cylinder glass tube at the beginning of the pendant to enhance the swaying movement. These pretty earrings are marked W. Germany and are truly sweet, unique and collectible! Clip backs. Excellent condition. Fabulous earrings for weddings, proms, parties and special functions! US$88.00. SOLD.